Find out which couches on campus are too soft, too hard, or just right. Regent University can pride itself not only in its diverse student body but also in its diverse selection of sofas. They range from plush and pristine to downright crappy, not even worth the price at a garage sale. Every building on campus seems to have at least one sitting area with a few choice couches. After much deliberation, we at The Daily Runner made a list of those we found most noteworthy – whether they’re perfect studying spots or ought to be avoided. While technically they’re considered chairs, the size of these mammoths make them more like couches. Just outside the elevators, these plush twin chairs wait with open arms. They’re perfect for curling up in, reading, or talking with a friend if you need a quiet place outside your dorm. Sadly, the all-girls Foundation Hall cannot boast of such glorious seating arrangements. On the second and third floors, also just outside the elevators, wait two unscrupulous couches. One is striped in hideous colors, all lumpy and sinking, making it impossible to find a comfortable position. The other is white (or it used to be before it started turning colors) and sports a long gash with the stuffing coming through. The cushions are pathetic, for while they seem safe at a glance, when you sit down they sink like a sad balloon. I’d recommend crossing the parking lot to Constitution if you need a quality reading spot. If you need to get in some last-minute studying between classes, or if you’re in the mood to people watch, then the couches in Robertson Hall are for you. Located smack-dab in the center of Regent’s grandest hall, these orange leather sofas give you a view of the lobby and the hallways of the floors above. Aside from admiring the lovely architecture, you can also watch students and faculty hurry about their routines. The Rob Hall sofas are not ideal when it comes to napping or a quiet, isolated place to study. But they’re still a place to sit down, and I find that sitting still in the chaos and watching everyone else rush around can be comforting every now and then. In what’s commonly referred to as the staging area, there lives a family of the most wonderful leather sofas. They’re soft and sink in a little but not to the point that they’re uncomfortable. 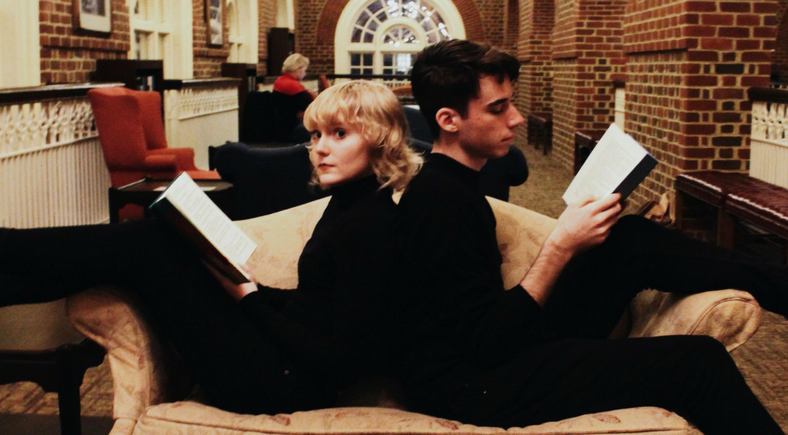 They are perfect for napping – perhaps the most napped-on sofas in the school – and provide a cozy space for all the Animation, Film, and Theatre majors that need a break from their busy artist lives. Adjacent to the staging area is the Greenroom with its own sofas. While the couches in the Greenroom are good for socializing, they’re not as soft as the ones nearby, though they can serve as a good napping spot if there’s just too much noise from the staging area’s frequent hustle and bustle. Regent’s library has plenty of sofas and sitting areas, but none is more revered than the prestigious third floor balcony. The location is not too secretive; it only feels that way because the balcony does not draw too much traffic, and its entrance takes some searching to find. But the balcony is well decorated with bookshelves and chandeliers and a collection of sofas. They aren’t the softest on campus, but this can be beneficial, as it prevents students from falling asleep too easily. The nearby windows overlooking the campus are an added bonus. They certainly aren’t anything special, but they have a spot here because every student living on campus has had to deal with these not-too-comfortable couches. They’re nothing much to look at, but they serve their purpose well enough. Extra points for those students who drape much softer blankets over them or found some way to make them slightly more comfortable. The labeling of these sofas comes from the fact that they may as well be found in one’s living room. People eat and drink on these sofas. They nap on these sofas. They laugh, cry, and read on these sofas. Sometimes they even jump on them (which I highly discourage. Take better care of your furniture, fam). This is an urgent warning to all students and faculty who use the Student Lounge: one of the sofas is an imposter. It may look identical to all the other sofas on the outside, but beneath the cushions is a mess of stuffing and springs that leads to a dark and consuming abyss. Once the innocent and unsuspecting student sits down, the cushions give way, and the sofa attempts to swallow its prey. I myself am a survivor of the Devil’s Couch, having once fallen into its terrible jaws. With the help of another student, I was able to pull myself free before I was devoured. I vowed never to make that mistake again, but the Devil’s Couch has a nasty habit of changing its location in the Lounge, so one can never be too sure. I am convinced there may be some poor souls who did not escape and are still trapped inside. I pray that someday, some brave student will step forward and lead an expedition into the bowels of this foul piece of furniture to retrieve said missing students. In the meantime, take this as a warning to check the sofa cushion before you sit down in the Student Lounge – it might just save your life. Finally, we come to the last sofa on our list, which is the lovely pink couch located in the office of our very own Daily Runner. It’s a great place for brainstorming, and it has occasionally provided that much-needed napping spot. We’d love to have you stop by and share your stories while enjoying the comfort of one of Regent’s cutest couches! And that’s our list of Regent’s most memorable couches – for better or worse. Comment below to let us know if we missed any good ones, and please share your own favorite places to study on campus. The couches don’t have to have a monopoly on them. There’s no secret to the secret sofas. There is a sign on the door showing the balcony is for law students and lawyers only. Please be considerate of people with very intense study schedules who sometimes can only see the sun during the day by studying on that balcony.